The Livonian is a language of the Finnic family, closely related to Estonian and spoken in the region of Livonia, in the North of Latvia and South of Estonia. I first came across the language in March 2003, during a students’ exchange in the framework of the European Commission Youth programme organized by the students associations of AEGEE Zaragoza and Tartu (Estonia). During that exchange, in one of the evenings we attended an especially arranged concert in a small bar. The place looked like a cellar. The group of music was introduced to us as the only group singing in the Livonian language. I know wonder whether that group was “Tuļļi Lum“. Sincerely, I cannot remember the name of the group that played that night, other than being presented as the only band singing in Livonian. On the other hand, Tulli Lum was already existing then and the singer studied music in Estonia… who knows. The Livonian is an endangered language. In 2003, it was introduced to us as being spoken by no more than ~120 people in the World. Today the Wikipedia mentions that the last known native Livonian speaker, Grizelda Kristiņa, died in 2013. Livonian may be spoken as a second language by over 200 people, just about 40 of those with a level of B1 or upper. In that night in 2003, we were explained that the language was being supported by some European institution funds. It was 10 years ago, I cannot recall the details. I guess they referred to the European Bureau for Lesser-Used Languages (EBLUL). The EBLUL was a NGO set up to promote linguistic diversity and languages. It was founded in 1982 and had close ties with both the European Parliament and the Council of Europe, and was funded by both the European Commission and local and regional governmental organisations. The European Bureau for Lesser-Used Languages was closed by a decision of its Board of Directors on January 27, 2010. The main official reason given was that “the funding mechanism of such an organisational model [was] not suitable in current circumstances”. I came across Livonian again when playing with the UNESCO Atlas of the World’s Languages in Danger, which I discovered via Twitter. 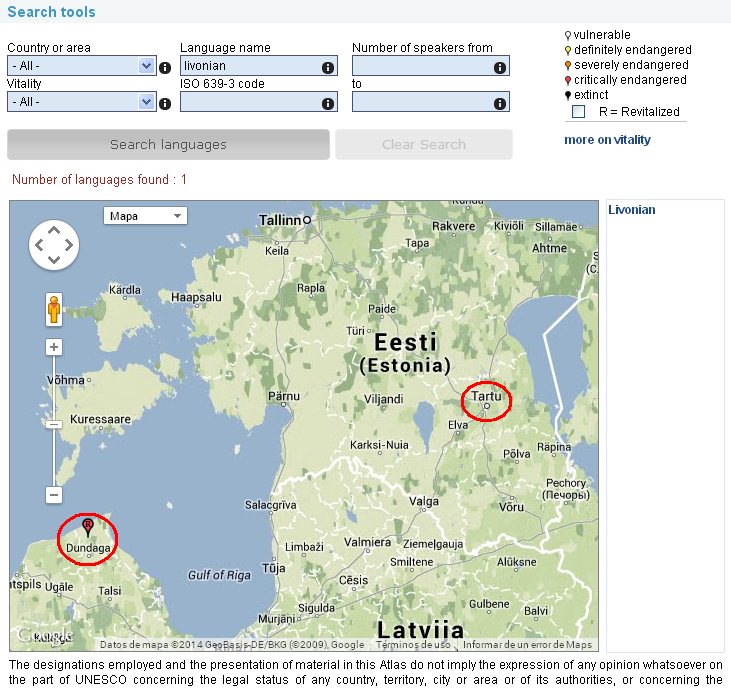 See a screenshot from the tool below, with the situation of Livonian, “critically endangered” and “revitalized”. Livonian, UNESCO Atlas of the World’s Languages in Danger. I found this tool from UNESCO interesting. I suggest you try it out a bit. I am happy for those people who played music for us that night back in 2003 that the language seems to be revitalized, though I have no way to measure or sense that. On the other hand, and despite of the criticism that my position may create, and as I have mentioned in several conversations in the past: I see no wrong in letting the language die. I do not see the purpose in pumping public European funds so that a language can be taught to non-native students at some universities. I am almost glad to see that the EBLUL has closed down and clearly understand why “the funding mechanism of such an organisational model [was] not suitable in current circumstances”. My view: I am a native Spanish speaker thanks to some language evolution that meant that once almighty Latin is no longer spoken outside of the Vatican City, plus the extinction of who knows how many ancient languages spoken by my ancestors. It especially strikes me the language used by UNESCO: “ecological knowledge that may be essential for the survival of not only its speakers, but also countless others.” I guess it’s quite the contrary. Had a certain language been so essential to the survival of its speakers and its extinction would have not taken place (or am I getting something wrong with what evolution means?). Luckily, the same evolution process has happened in all parts around the world: allowing over 400 million of people to speak Spanish as a mother tongue and allowing us to fairly understand each other in several corners of the world. That evolution is not “natural” if such thing can be said about languages. If Spanish is spoken by 400 million people, that among other factors is because the elites of the American republics decided to teach Spanish to the Indians (during the colonial times, the Indians spoke their ancestral languages or some Amerindian language promoted by the Church, such as Quechua, Nahuatl or Guarani). If barely any Filipinos speak Spanish, that’s because the Spanish authorities did not care, the American conquerors actively promoted English, the Japanese didn’t care for Spanish and the republic authorities decided to standardize the Filipino language around Tagalog. Had those in power decided otherwise, the number of speakers of Spanish could be different. Same with Livonian, if the Russian, Soviet or Baltic authorities had chosen other languages for mass education, the situation could be different. State power is not the only cause of the status of languages (compare the role of Irish in Ireland with that of Spanish in Gibraltar) but it can be a decisive factor. I can only agree with you in that “State power is not the only cause of the status of languages (…) but it can be a decisive factor”. I didn’t mention that languages evolution was “natural”, I only tried to counter UNESCO’s argumentation “ecological knowledge that may be essential for the survival of not only its speakers, but also countless others.” If that had been true, the languages would not have disappeared, or rather, would have disappeared with the complete populations. If populations adapted and learned other languages then a certain language was not “essential for the survival of its speakers”.